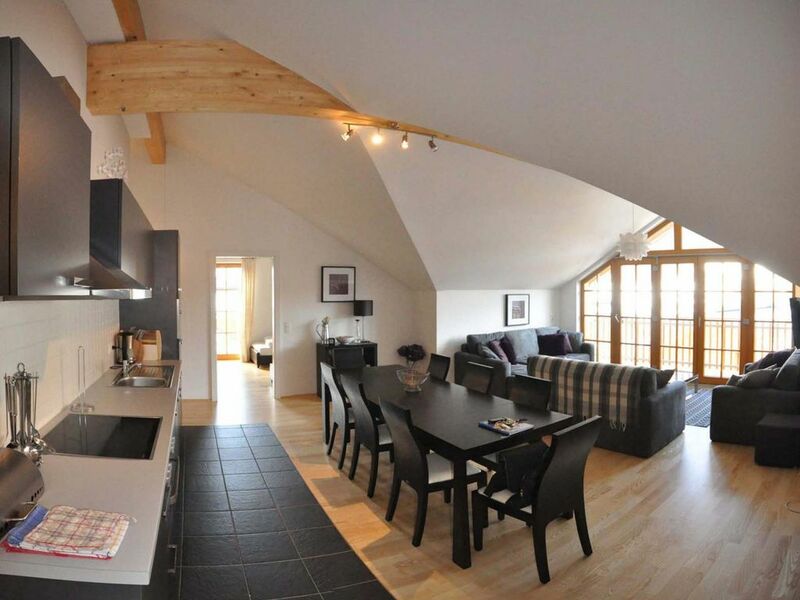 Our spacious penthouse apartment (108m) built in 2008 is situated in a mountain spa resort in the middle of the Hohe Taurn National Park on the edge of the beautiful village of Rauris. The luxury penthouse offers four spacious bedrooms, one master double with en-suite shower room and three twin bedrooms, all with a balcony affording stunning views of the mountains. They are all similarly equipped with a wardrobe and chest of drawers, with a hairdryer in the main bedroom There is also a large main bathroom, with full size bath, shower, separate WC and heated towel rail. The contemporary open plan living area is equipped with all modern facilities including free WiFi and Internet, Cable TV, iPod / phone dock. The apartment has solid wooden floors and underfloor heating throughout, with separate thermostatic controls for each room. The area has bifold doors, opening onto a balcony with stunning views across to the main gondola and the Schonblick valley. This layout offers optimum solution for eight guests to easily enjoy the spacious accommodation. The main gondola and ski school which can be seen from the balcony is within five minutes walk of the apartment. The beautiful village centre of Rauris with a wide range of shops, supermarkets, restaurants and bars is also a five minute walk. Outside the apartment is a children's play area, visible from the balcony, and communal barbecues for use of residents. There is also a reserved covered parking space in an underground garage, with direct internal access to the apartment. The area is perfect for summer with plenty of activities including: golf, fishing, walking, white water rafting, tennis, swimming, mountain biking and squash. Rauris is less than one hour drive from Salzburg airport, and can be reached by train to Taxenbach with a taxi up the valley. Having been to Rauris many times in the past, we were overjoyed to have found this stunning apartment for sale. Rauris is a beautiful unspoilt friendly village with wonderful mountain air and picturesque views. We love the atmosphere in the centre, and the facilities available at the resort. We will be regularly visiting with our children, who thoroughly enjoy both the winter and summer activities that the area has to offer. En suite shower room to master bedroom, complete with shower, WC and basin. Main bathroom with bath, overhead shower and basin, Separate WC. All rooms underfloor heated. Huge open plan living room with bi fold doors opening onto balcony with panoramic views down valley. Large dining table, 3 sofas, comfortably seating 8, 32 inch Television, cable TV with access to English Programmes. Free Hi speed Wifi / Internet. Fully equipped Poggenpohl kitchen, including Hob, oven, dishwasher, microwave, toaster, fridge / freezer coffee machine, washing machine, ironing board and iron. There are two 18-hole golf courses in the region (par 72/73) located in the sunny Salzach Valley with amazing mountain views of the Hohe Tauern National Park. Situated beside each other, they form a flat, park-like terrain surrounded by biotopes and a number of lakes. The courses are open from April to November. Both courses were designed by Donald Harradine and have held several international tournaments with players such as Greg Norman, Bernhard Langer and Seve Ballesteros being delighted by the carefully tended and well maintained courses. They have been awarded the quality seal of ‘Leading Golf Courses, Austria. Excellent stay in a wonderful cosy apartment. Family of 6, all adults / late teenagers. Plenty of room, warm and very comfortable. Only 5 mins walk to the lifts and same to the lovely village centre. We are very glad you enjoyed your stay. We look forward to welcoming you back in the future. Could not find a fault in this property the owners have been fantastic, the property service owner was also very helpful. You will enjoy your stay here. We had a lovely time in this apartment, the bifolding doors offered a fab view from the comfortable living room. The apartment had everything needed for our stay and was very clean. Our only critisisum was the fridge, it was very tired and needs replacing. We found some great places to eat just a short walk from the apartment in the lovely village and everyone was friendly. Our grateful thanks to a very efficient Caitlin who met us on arrival and departure. We are very glad you had a lovely time and enjoyed the area and apartment. You will be glad to know that we will be replacing the fridge this Autumn. The apartment is superb and was easily big enough for our party of 5 adults and 3 children. We cooked in several times and the facilties were more than adequate. Although there is no lift in the apartments it was no great problem walking up and the views are worth it. Underground allocated parking was a bonus. The shops and restaurants are a short walk away,as are the slopes. We hired a ski locker at the main lift which made it even easier to walk to and from the apartment. The skiing is good and suited all our mixed ability group. The local instructors were very good, even getting one of the girls on her second ski holiday down the black run! I would recommend this resort and apartment to anyone looking for a good family ski holiday. So pleased that you all had a wonderful time! So pleased that you all had a great time too Jappy, hope to see you again soon! Rauris is a beautiful traditional village on the edge of the Hohe Tauern National Park in Austria. There is an excellent ski school, one of the oldest in Austria. The ski area is well serviced and offers both on and off piste excitement.There is easy access to other skiing areas within a 30 minute drive including Kaprun, and year round skiing on the Kitzsteinhorn glacier. There are numerous walking and cycling trails in and around Rauris. Cycle hire is available in the village. The paths are well marked with walking times and mountain huts for refreshments. There is also a outdoor pool situated up on the hillside, reachable by a 10 minute walk from the apartment.